Don't delay treatment. Maybe it will go away is dangerous thinking! No Referral Necessary, We will help you get your Police Report and any help with papers! ** BEWARE** There are other injury offices directing you to their office using our name or a similar name. Don't be fooled! There is only one "Injury Care Chiropractic," just ask for Sherri and she will make sure you are at the right place. Torn Swollen Ligaments following accident! Slip and Falls can cause injury to any of your joints. Lasting months, years or even become permanent! We Are Trained To Treat All Areas Involved With Your Accident. We Give Expert Chiropractic Care and can treat not just your spine only, but all related joints involved with your injury. Children are never at fault! Children take high priority with us! Job accidents happen everyday and you can see us first! If you go to the Emergency at a hospital, then just come directly to us and we will see you immediately! You need no referral for Expert Chiropractic Care! Walk-Ins Always Welcome...Transportation provided if needed. Seen Immediately! If you need X-rays, MRI's, CT scans or other tests, they will be performed to find out your cause of pain. Pain management or referral to an orthopedic surgeon will also be provided if needed in your care. Our aim is to give you the best care possible! We believe in a team work of professionals in your time of injury. We will give you strong documentation of your injuries in case of litigation for pain and suffering. **Need help with your paperwork? No problem, one of my staff will help you fill out all necessary papers related to your accident! Immediately following your accident there could be an adrenaline surge that mask your pain which can be a normal defensive mechanism by your body following injury. This is why it is best to come in for an examination for yourself, spouse or children immediately following a car wreck. Statistics show the longer you wait for treatment after you are injured, the longer it takes to heal and prolongs treatment and can become permanent. A myth your insurance company might tell you. "You will heal on your own, because it was minor". No, most likely, you can have pain and disability for many years without care. Even at speeds of 5-10 mph. However, if you have any of these symptoms, call us immediately for an orthopedic and neurological examination. Reasons why you should be examined by the "Louisville Accident Doctor" following a car wreck! Because we know accident care! 99% of our patients have been involved in accidents and our treatment is very effective. 1) You may be injured and may not even know it. Our doctors are very experienced in the care and treatment of auto injuries of the spine, joints, and soft tissues. 2) Injuries such as whiplash may not show symptoms for hours, days or even weeks. 3) Medical professionals all agree that the first 72 hours after an accident is the most critical and effective time to receive treatment. Delay may lead to chronic, permanent and/or arthritic changes. 4) The majority of injuries from automobile accidents occur at speeds of 6-12 MPH. Your car may not reveal any damage, but your body might. Cars are designed for collision, our bodies are NOT! 5) A soft-tissue injury may become permanent. If not properly treated, scar tissue can form around joints, in ligaments and muscles leaving them less flexible and prone to re-injury. 6) Scar tissue can start forming on soft tissue after the first 24 hours and cause more pain and disability if not attended to. *If you have injuries and are in litigation. You need strong documentation of your injuries. 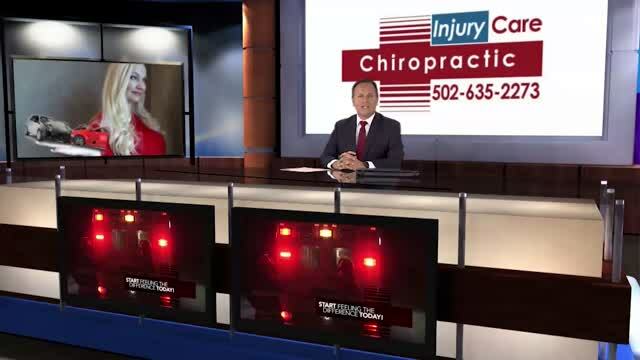 You will feel more comfortable knowing that the "Louisville Accident Doctor" can treat your injuries and work with your attorney and insurance company. The best way to think about your accident is to get checked out immediately. Even if you are not injured, you can sleep better at night knowing you had an extensive exam and/or X-rays and found out everything was fine. One call is all there is to getting the help you need. Just call Sherri, she is standing by to answer your questions. She is not located out of state like most helplines. She is in Louisville and ready to help you. More than a helpline. Unfortunately accidents do happen even with School Buses. We provide special attention to these special little people. Many times children do not complain like adults. Difficulty sleeping, mood changes, or irritability could be a sign something is wrong. They should always be checked out with a detailed examination. We also see many City Bus Accidents, if you have been in a bus wreck. Hurt on the Job, you can see us first for your injury at work. On the Job Injuries seen at Injury Care Chiropractic. Come to us first! City Bus or Tarc Accidents. These are very common areas of the neck and back to have pain, stiffness, soreness, burning sensations, tingling or numbness following a car wreck. Don't delay treatment! At injury Care Chiropractic, we give expert Chiropractic treatment and have the experience of treating thousands of accident victims for many years.